A trip to the library last fall yielded a plethora of art ideas. 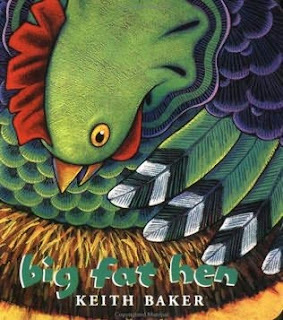 Keith Baker's Big Fat Hen is filled with fabulous illustrations. Colorful, vibrant, detailed and adorable. Perfect for fifth grade! 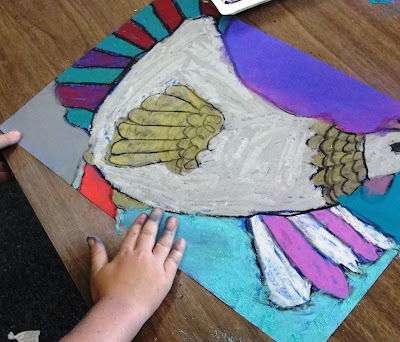 Similar to my chalk lizard project, this lesson produces fabulous results even for the self-proclaimed artistically-challenged student's. 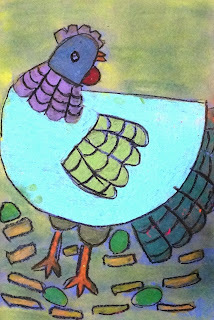 I photocopied a few of the hens from the book and handed out the images to the students. We talked in detail about the different patterns and silhouettes Baker uses in his illustrations. 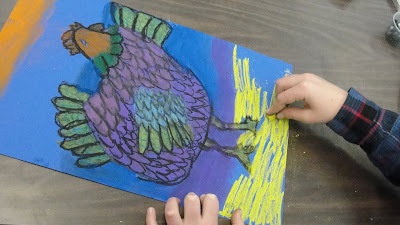 I encouraged the students to become the illustrator...to draw as well as they could, in Keith Baker's style. I use the same basic technique for drawing the hen as I do for most animals: Start with the eye placement, then draw the head"cap" (the head looks like a sideways letter "U"), then the beak (two triangles), then the body. 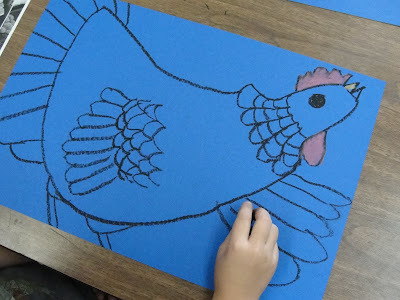 Try looking at the pictures in the book and drawing the hen for yourself. Make note of what you draw first and how you might explain that to a student. Often, if you can't figure out why you draw something first or last, that indecisiveness translates back to the student. Keep the shapes simple, and you'll be fine. Fill the page as best you can! The next step is fun. 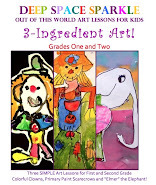 Set out the oil pastels and let the children color as they see fit. Keeping the illustrations in mind, encourage whimsical colors. No black and white hens please! 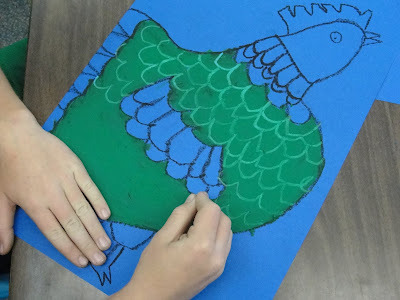 Here's a tip: layer a section of the hen (feathers, wings, etc) with one color then add patterns on top of that color using black or another strong contrast color. Again, check out the book for Barker's incredible color combo's. The background is meant to be simple. Using chalk pastels, add sweeping layers of colors. No need to draw anything in particular, just swaths of color are fine. Fourth and Fifth Grade Results! What a marvellous 'big fat hens'! This is a lesson I'd like to do with my students too. Thanks for this wonderful lesson! Totally gorgeous! thanks for the idea!! 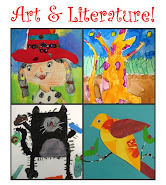 I love children's art projects that are inspired by/connected to children's books! Thank you, and keep them coming please! love this lesson- how much time did the students spend making these hens? Hi Ann...I taught this lesson in two 50-minute sessions. 3/4 of the class finished. Lovely Collections. I like Pastel Arts even though am not a water colorist.